Hoorah I’ve finally become not lazy and decided to upload some pictures…let’s hope I still remember how. These are originals (on the top) and tray 23’s (on the bottom). And looking at those pics now….I can see that the bottom picture of my bottom teeth…is mirrored from the originals…for some odd reason. I don’t know how that happened. Or how to fix that….weird. Anywho…there they are! I can’t wait to finish treatment…it’s been too long. Phew, it’s been quite a while since I’ve posted on here! Let’s start off with the invisalign update. I’m on tray 23, this Tuesday will be tray 24. So if math is correct, and it usually is, I have 14 more trays to go! 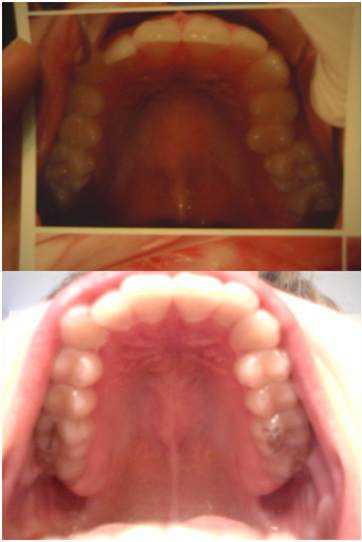 So on January 29th, 2013 I will be putting in my last set of trays! It’s crazy now that I look back how fast it’s gone by. I remember dying to get into the double digits! Now I’m dying to get to January! 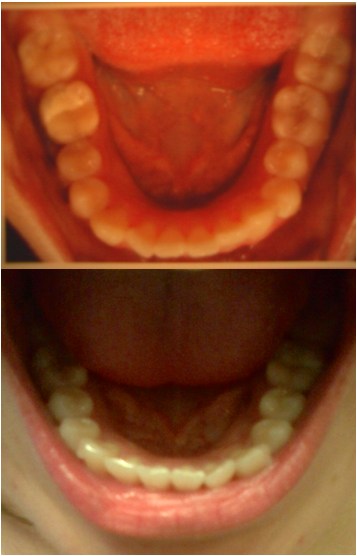 Sadly there’s no visible changes with my smile, most of the movement has been with my back teeth. It’s great though, I can very much see a difference, especially in my top teeth. With my bottom teeth I just have one tooth that’s still crooked. After that, it’s going to be dooone! I think. I’ll try to post pictures later. I also went to the dentist for the first time in like 5 years to examine that cavity. They told me it was in fact a cavity and I had one other that needed to be fixed. My ortho wanted to know if the dentist could wait to fix it, as the invisalign trays wouldn’t fit as well after a filling. My dentist fixed one and had me bring in my trays so he could make sure the trays would sit well. So all’s set and done and I just have one cavity left that we will wait to fix until my invisalign treatment is over. I’m actually surprised that I only had 2 cavities after 5 years. I’m pretty proud =) . Alright other updates. I’ve graduated…I now have a bachelor’s degree and going back for my master’s! Yippee! There’s been a LOT of stress with the trip up for graduation (won’t go into it, but I had an adventure with being pulled over), there was also car troubles. Other stress came with registration. Still waiting for spots for some required classes. I’ve got a computer upgrade and with that came a loooot of gaming! Diablo 3, Left 4 Dead, Payday the Heist, Deus Ex: Human Revolution, and considering the steam summer sale, a lot more to come! There’s tons more! But again, I won’t bore you. Happy reading, Happy Summer, Happy Gaming, Happy Invisalign….ing!